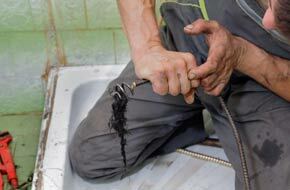 We offer professional Atlanta drain cleaning service for clogged drains, slow drains, blocked drains, and more. Whether it's a pipe, toilet, sink, or shower drain- we offer a level of professionalism to clear the most stubborn drain problems. Before trying to a DIY method or store-bought drain cleaner, remember: a clog may be much deeper in your plumbing system and require a video camera inspection. Also, not all drain cleaners are created equal and some may actually be bad for your plumbing, sewer, and septic systems- breaking down bacteria essential for an effective septic system. From small jobs to larger pipe clogs- we do it all!